Looking for the best weed killers for grass in 2019? Then you're in the right place! Concentrate grass and weed killer is an all-around crowd pleaser: it's affordable, effective, and fast-acting. Here's how it works: the spray is sold in a concentrated form which is mixed by hand with water. You'll need an external spray nozzle to administer this spray across your lawn, and we recommend something like this which can be reused for several different purposes: Chapin 2-gallon multi-purpose sprayer. Not only does this spray become resistant to rain in a matter of hours, but it begins to work weeding out your weeds within mere days. Customers report that it kills off the weeds in the yard between 2 and 4 days, meaning that by the end of a week, you should see a beautified lawn. The solution is sold in four different size options: 16 oz, 32 oz, 1 gallon, and 2.5 gallon jugs. We recommend the gallon container for its volume-to-price ratio. With this size, you can mix 85 gallons of weed-killing spray over time, and cover up to 25,000 square feet of your lawn! If you're interested in learning more about weed killers or want to read more about the other products we considered, see below! Want to skip all this research and just hire a decent exterminator for your pest problem? What Makes a Weed Killer Good? Short on time? Take a look below for the top 5 in our list. Otherwise, check out our buying guide. Weeds, unfortunately, are the bane of every gardener's existence. Even if you don't have that much of a green thumb, you can agree that weeds are unsightly, and you'd really rather not have them junking up your lawn. Luckily, there are a few different types of chemical solutions that help landscapers and laymen alike with controlling these pesky plant intruders. Take a look below at the different types of weed killers out there. These weed killers are meant to be used before a new crop or flower is planted in a garden. This type of weed killer is used as a preventative measure against weeds, and is recommended for use a few days before planting of the targeted crops or flowers. Additionally, you can use preplant weed killers just before planting your targeted crops. As long as you're using the weed killer BEFORE planting the flower or crop you actually want in your garden, you should see successful results. A pre-emergent herbicide acts as a prevention agent for new weeds to sprout through the soil. While it doesn't kill existing weeds or stop the weed seeds from germinating, a pre-emergent weed killer works to prevent the emerging of the root systems, effectively hindering the weeds from steady growth. Without proper root growth, the plants are unable to branch out and grow properly! Dr. Justin Moss, a Turfgrass Specialist for Oklahoma State University, elaborates on pre-emergent weed control tactics he used as part of a demonstration held in 2015. Listen to what he has to say in the video below. On the other hand, post-emergent herbicides are used to kill weeds that have already grown in a certain area. Generally, these chemicals take the form of sprays which are doused onto the weeds to kill them on contact. The chemicals will seep into the root systems, weakening them at the core, ensuring that they won't re-grow. There are a few key factors to consider when shopping around for a quality weed killer in your grass. Check out the sections below for a bit more insight. Many different weed killers will come shipped in a concentrated form, which is intended to be mixed by hand at the time of spraying. This gives the customer more control over the mixture, and the ability to either dilute or concentrate it higher, depending on his or her specific needs. In contrast, ready-to-use sprays are more uniform and more convenient for the user. They require no extra assembly, and often are much less prone to mixing mishaps. However, if your garden needs a bit more TLC from a weed killer, this may not be the most ideal option for you. A selective weed killer works to kill only the weeds within a sprayed area, honing in on the pesky plants and leaving the desired plants alone. A non-selective weed killer, however, does the opposite. These herbicides tend to wreck everything in their path, and it's recommended if you choose a non-selective weed killer that you protect the plants you want to keep, because otherwise, you may be saying goodbye to them. For a quick explanation on how to safely apply non-selective herbicides around your grass, check out the video below. Weed killers have been shown to be mostly effective. Due to shifting climates and terrains, there's no 100% efficacy rate. However, when used properly and consistently, weed killers should eliminate your ugly weeds and beautify your lawn. This solution is ideal for those who would like an all-in-one weed killer that simply works. Compare-N-Save developed a formula that works to target weeds and grasses that will leave your yard looking beautiful in a matter of days, not weeks. After just one application, the fast-acting formula sets to work—after just two hours, the solution is rain-proof, which eliminates the need for reapplication. 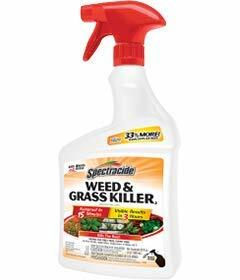 Because of its concentrated state, the gallon jug can mix up to 85 gallons of prepared weed-killing spray over time. This should cover around 25,000 square feet, meaning that your grass will be protected from weeds for a long time coming! 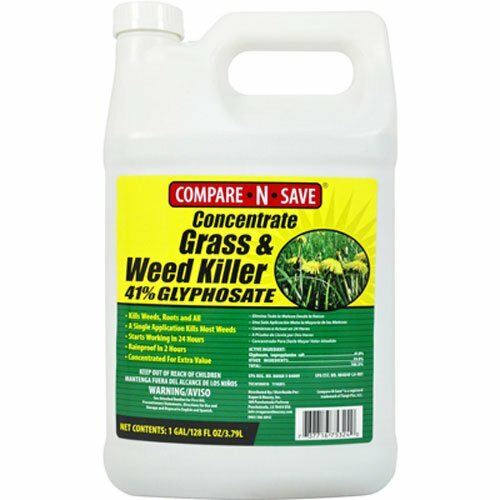 Compare-N-Save Concentrate Grass and Weed Killer requires the use of an external spray nozzle, which is sold separately. We recommend this product to those who want an all-around effective product to kill weeds in grass that won't break the bank. What makes Southern AG 2,4-D Amine Weed Killer different from the rest is the fact that it's a selective weed control substance, which is like liquid gold for gardeners. Essentially, it's an herbicide developed to target only the weeds, while leaving desirable plants (like lawn turf and flower beds) alone. If you've got unsightly weeds crawling along your garden walls, this is the weed killer for you. This is a concentrated spray, meaning that the user must mix it manually. However, instructions are included with the spray which detail the exact ratio for proper mixture. 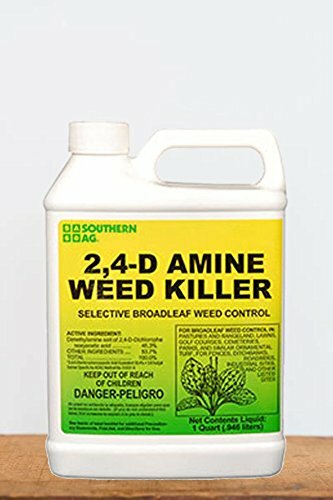 Southern AG 2,4-D Amine Weed Killer requires the use of an external sprayer, which must be purchased separately. However, this can be repurposed for other things in the future—or even for future herbicidal sprays. Spectracide has developed an easy-to-use spray which is indispensable for homeowners in their Weed & Grass Killer. This spray can be used on all types of terrain—grass, rocks, pavement, bricks, you name it! Another factor that separates this weed killer from the rest is that it's fully ready-to-use upon arrival. There's no mixing involved, and no separate spray nozzles required. You can simply spray away your weeds and watch them wilt! Within 15 minutes of application, the formula is rainproof. After three hours, the spray begins working to kill the weeds from the root upward, ensuring they won't grow back. We recommend this weed killer to those who want an easy-breezy way to tackle a large number of weeds in their yard without the hassle of investing in a ton of extra equipment. 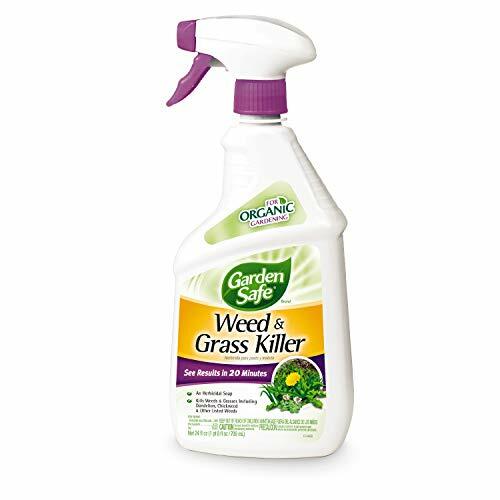 Garden Safe 93065-1 Weed and Grass Killer Spray is perfect for those who like to grow their own food because it uses a combination of herbicidal soap and other natural ingredients to kill pesky weeds in the garden. The 24 oz bottle ships fully ready-to-spray with its own nozzle, meaning no extra purchases are necessary. After the first application, you can see results in as little as 20 minutes! Weeds will begin the wilting process, dying and turning brown right before your eyes. This spray is non-selective, which means that it does not target a specific plant. In order to protect desirable plants in the garden, be sure to protect flowers and grasses with plastic or cardboard. We endorse this spray to those who are looking for a greener, more natural solution to tackle weeds in their gardens. No one wants ugly weeds sprouting up in their grass—that much is clear. And, to be honest, no one has the time or the energy to properly yank them all out by hand. Curious about other grass related products? Check out our other detailed guides to help you deal with your pest problems.